The results of the survey challenged the flood risk managers’ perceptions of how the general public interprets the warnings and information that they provide. Rather than outright ignoring the information from these sources, people often take the warnings along with various other sources of information such as friends or environmental cues to make decisions. Survey respondents reported that they recognize the possibility of flood danger in intersections with warning signs or barricades, but that because the signs and barricades do not indicate the presence of current danger, they look for other cues such as the depth of water relative to the street curb. Two of the primary deterrents of crossing behavior – fines and the embarrassment of being labeled a “stupid motorist” – were among the least influential situational factors affecting respondents’ decisions to cross or not to cross. 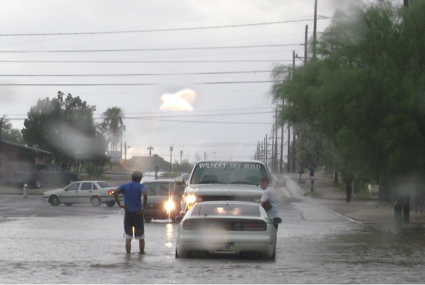 The most influential factor in the decision to cross a flooded roadway was the successful crossing of another vehicle, particularly if that vehicle was perceived as smaller than the respondent’s own vehicle.